The Port St Francis Ski Boat and Yacht Club has a fine Clubhouse overlooking the Port. They run two official fishing competitions per year, the Port St Francis Tuna Challenge in July, and the Kouga Festive Fishing Competition in December. They are involved in fishing, recreational boating and competitions. 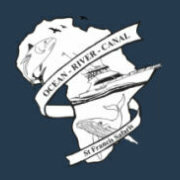 The St Francis Bay Rod, Reel and Boat Club has been successfully running competitions and initiating and developing junior angling and competition fishing. The Club runs the Rodman Grand Slam and awards a trophy to the fisherman who lands the heaviest fish caught during the Jeffreys Bay Vang-‘n-Tannie, the Port Elizabeth Tuna Classic and the Port St Francis Tuna Marlin Challenge. The Club is affiliated to IGFA and the South African Deep Sea Angling Association SADSAA)> The Club offers boat surveys, advice on skippers tickets and all general fishing info. 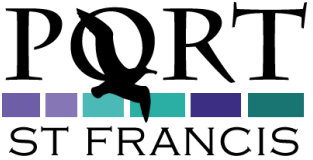 All paid up members are affiliated to the SADSAA. All welcome! St Francis Safaris, established in 1990 by Tim Christy, is the pioneer who brought exciting outdoor activities to Port St Francis with the emphasis on a variety of ocean activities. 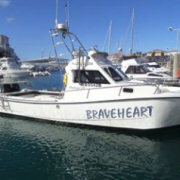 Tim and his staff are all professional Satour Qualified Guides, with an excellent reputation for captaining many deep sea fishing excursions as well as close encounters with our majestic whales and dolphins during sight seeing cruises. 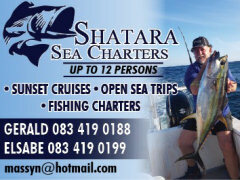 St Francis Safaris is the only permit holder for boat based whale and dolphin sight seeing cruises in the entire Kouga. Take a relaxing ocean cruise around the Cape St. Francis Area. Take up the challenge and fight the famous yellowtail or enjoy the thrill of hooking up on a good size cracker. The cob is biting now and good sizes get landed!!!! !